A new video of Lisa Marie Presley singing "In the Ghetto," accompanied by her late father, Elvis Presley, will be posted Friday on the AOL Internet site Spinner.com, a company spokesman said Tuesday. To mark the 30th anniversary of her father's death, Lisa Marie Presley's voice was added to the original version of her father's hit song from 1969. The video duet also features images of her late father. Spinner.com will post the video along with the transcript of an interview with Lisa Marie Presley, AOL spokesman Kurt Patat said. 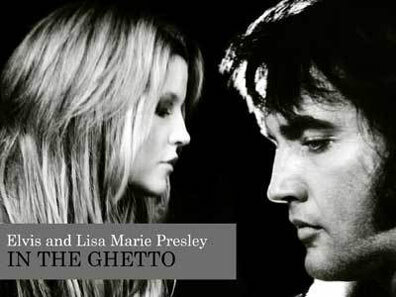 In the interview, Lisa Marie Presley said the project was emotionally stirring. "We had two hours to lay down my vocals," she says. "So the next morning, I heard the rough ... and ... I've never cried when I've done anything ... ever ... but I just lost it when I heard it. Lisa Marie Presley also talks in the interview about how she was offended to see her father's song "Viva Las Vegas" used in a Viagra commercial. "I find that revolting," she said. "Some songs we have no control over. I know we didn't license that one." Proceeds from the new song and video will be used to help build temporary housing for the homeless in New Orleans, she said. The project is to be similar to Presley Place, a 12-unit apartment building for the homeless built in Memphis by Elvis Presley Enterprises Inc. in 2001. Lisa Marie Presley, 39, is scheduled to attend a concert Thursday in Memphis that will feature her father performing on video, with live support from his former backup singers and band members. Her most recent album of her own music was "Now What" in 2005, but she said in the interview that she hopes to put out a new album soon. "I'm definitely going to do it," she said. "I just have to figure out the right way. I'm on a clean slate right now _ I just got off my label (Capitol Records). So I'm figuring out my next route." I admire Lisa and the way she deales with her position in life as the daughter of the most loved and most talented artist in the whole wide world. She is trying to move on, like all mature people should. However, we are all too aware of those who either can't move on themselves or continually find fault with those that do. Like I stated before, she is damned if she does & damned if she doesn't. I have met her & she is a very down to earth lovely person but I wouldn't want to walk a mile in her shoes for all the money in the world! Talk about disrespect to Elvis???? How more disrespectful can you be to HIS memory and to his name than to dis his daughter the way all of you are doing here...And you know what??? She don't need ANY of you. She has fans of her own...not JUST her dad's fans...but don't ever doubt that her dad's fans love her too...and as a TRUE fan of Elvis Presley...I would NEVER disrespect his daughter the way you non-fans have done here.....You should be ashamed to even call yourselves Elvis fans...You're not TRUE..or you wouldn't talk crap about his daughter. If you don't like her...don't buy her albums or go to her concerts...but keep your mouth shut at least out of respect to someone you CLAIM to be a fan of. What is she a Princess of Jocko Jackson and his Fairy Land? I think a CD of duets with Elvis would be a good thing... I'd buy it. I do not think she should put out a complete cd of duets with her father. And yes, (Lack of) her voice if perfect contrast to her dads. Too bad she wasnt offened when howard stern made the comments he made when she was a guest on his show,i guess she had a cd to promote then though! Hey Lisa ! This is such a wonderful message ! And I wish you the best of luck ! Here in Germany the magazines and televison and radio channels are filled with stories about your father, with his songs and movies. It's the biggest hype since his passing. Elvis lives ! There is no doubt. Thank you so much for helping the poor people in New Orleans. Your dad would be so proud of you. God may bless you !